To become a paid subscriber of the Comodo GeekBuddy services, you need to register your account with Comodo using our online registration form. Click the 'Register' link and you will be taken to the purchase order form. Fill in the details as required in the order form and follow the process. 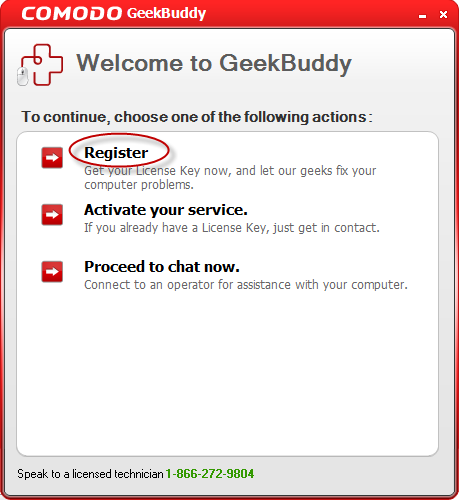 Your account with GeekBuddy will be created and your License Key in the order confirmation will be sent to you to the email address provided in the purchase order form. You need to enter this License Key when you access the service for the first time. Registration is a one time process for a single machine. The Comodo GeekBuddy license entitles you to usage of the service on up to three machines. You need to enter the license key when you are installing the client and registering the account from a different machine. So keep the License Key in a safe place.